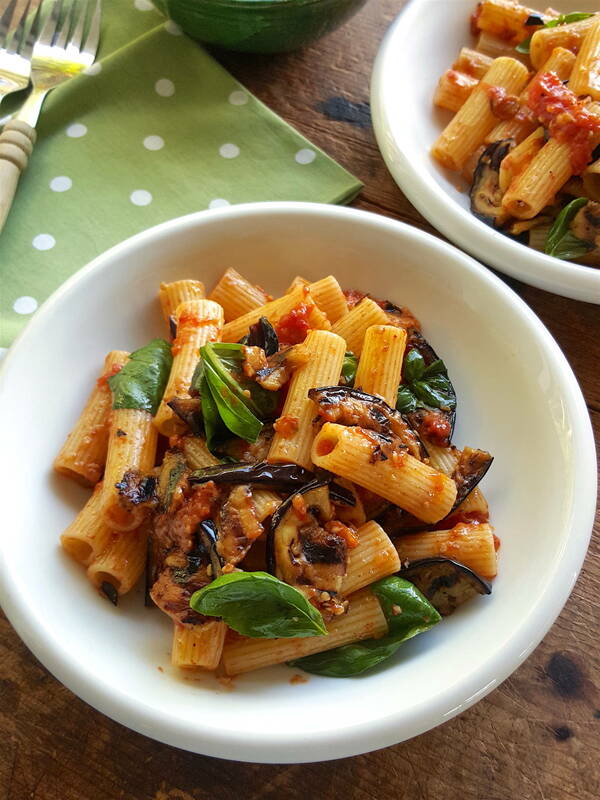 Eggplant and pasta, pasta and eggplant. Yep, they belong together. 1 Preheat oven to 220°C (425°F). Line a shallow ovenproof tin (I use a Swiss roll tin/jellyroll pan) with baking (parchment) paper. Cut tomatoes in half and arrange in tin cut side uppermost. Sprinkle with sea salt and caster sugar. Grind over a little black pepper. Drizzle with extra virgin olive oil. Roast for 20-30 minutes until collapsing and charring around the edges. Cool. 2 Heat a ridged grill pan or sturdy frying pan over medium-high heat. Brush eggplant slices with olive oil (you will probably need to do this in batches, so just brush as many as will fit in the pan without overlapping). Cook on both sides until a good golden brown. Transfer to a plate as they are done and season with salt. Cook remaining eggplants. When all the eggplants are done, set aside 2 large fleshy slices and cut the rest into quarters. Finely chop the 2 fleshy slices. 3 Put extra virgin olive oil, garlic and chilli flakes in a medium frying pan (skillet) set over a low heat. As soon as the garlic starts to colour, stir, and let it cook just until it turns a pale biscuit colour. Add the chopped eggplant, turn off the heat under the pan, and squish the eggplant into the oil. 4 Gently squeeze tomatoes over a bowl, removing the skin and letting pulp and juices fall into a bowl. Squeeze skins together over bowl to get the last of the juices. Add all the tomato pulp and juice to the pan and stir it in but don’t break up the tomato pulp. Add a few pinches of salt. 5 Cook pasta in the normal way – in a saucepan of plenty well-salted water until al dente, then drain, reserving 2 tablespoons of the cooking water. Bubble up eggplant and tomato sauce, and once nice and hot, add the pasta water and bubble up again. Add drained pasta to pan, along with basil, and shake pan until pasta is coated with sauce. Toss gently and serve with cheese. Go for it Shayne. It is so delicious I’ve eaten it all up! Find out about Julie Biuso & Debbie Mayo-Smith's amazing motivational, content-rich seminar full of valuable time-saving tips for your home and work life and come away a Happier, Healthier More Productive You!